"Truth and Roses have thorns about them." The fifth perfume in our series celebrating the aromatic landscape of the State of California is Rosa. Inspiration for this fragrance came when my friend Meghan took me over to the Theodore Payne Foundation and introduced me to the native rose of California. Up until that moment I had no idea that there existed a native rose. 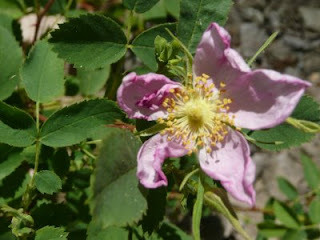 The botanical name for this wild rose is Rosa californica, a five petaled deciduous shrub important to local wildlife. In the book Introduction to California Chaparral the authors write "As a group species of chaparral roses are tough, resilient, woody survivors of an ancient vegetation that covered much of the western United States millions of years ago." (page 81) I have also been told that the upright, straight stems were used by the Native Americans for their arrows. Shortly after the Fragrant Alchemist workshop here in Los Angeles I began creating accords. The first two accords I formulated were a wood and a rose. The wood accord was utilized in the perfume devoted to the native oak, "Q". Where as the rose accord was admired by many as a perfume on its own, but took several years before it found a home in this new fragrance. The accord features two of the main notes found in a complex pure rose, such as geraniol (Rose geranium) and citronellol (Citronella). To the accord I added a very fresh Rose otto from Turkey and a deep, resonant Rose bourbonica absolute from India. This Rose otto comes from a family owned farm in the agricultural and rose district of Isparta, Turkey. The family is very conscious of caring for their plants to produce the best product available. Harvesting of the delicate blooms begins in May continuing on through June and July depending on the climate and yield of bloom. The Rosa damascena plants can live for up to 40 years, are approximately 3 1/2 feet high and pruned every year. Each charge of a still is packed with approx 500 kilos of roses. 1500 kilos of water yields approx 3.3 ounces of rose otto. 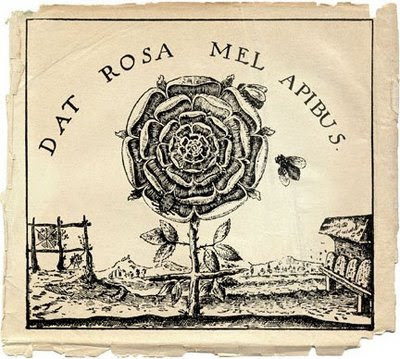 The rose water byproduct of the distillation is re-distilled (cohobation) and the resulting rose essential oil from that is combined with the rose oil from the initial distillation to create the recognizable rose otto which is sold. "Rosa bourbonica, also known as "Edward rose", is organically cultivated outside the holy city of Pushkar, beneath the mountaintop temple of the goddess Savitri. The flowers are freshly distilled in the fields in traditional alchemical vessels over low heat, giving the oil an extraordinarily high content of Damascenone molecules, which give roses their fragrance." 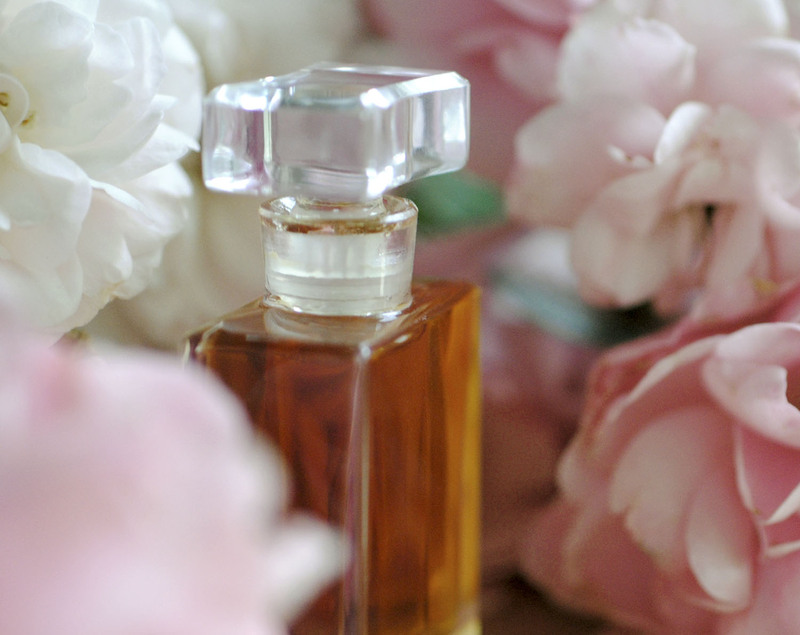 The perfume Rosa also contains a Leather accord, Vetiver and woods including the treasured Agarwood. The top notes are primarily from the essences that provide a citrus components. There were many versions of this fragrance, the one I expected to release was just a bit over the top on the earth aspect. I might incorporate aspects of it into the solid incarnation of Rosa. Rosa is an earthy, warm, woodsy rose that develops into a rich rosey bouquet over time. It literally blossoms on the skin of the wearer. The fossil records for roses go back into ancient time, perhaps 35 to 40 million years ago. Looking back into history we have all parts of the rose (petal, leaf, fruit and root) being utilized in medicine, ritual, literature and scent applications. Symbolically we see the rose associated with the love, beauty, the heart, and joy. The aromatherapeutics of a pure essential oil of rose contain the same attributes and more, including anti-fungal, anti-inflammatory, antiseptic, astringent and cell regenerative. This is where one can see the value of perfumes made with pure essential oils. Keep in mind that the cost per drop of a true Rose essential oil can run between $2 and $4! As I mentioned above this is the fifth perfume in the Californica series and Rosa californica has five petals. The fifth element, in the film by the same name, is love often symbolized by the rose. During the mummification process in ancient Egyptian culture the major organs in the human body were removed. 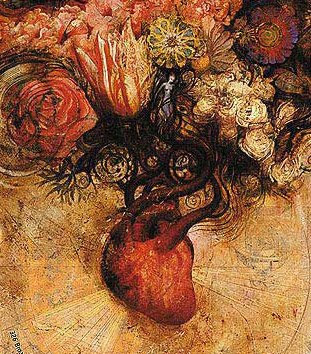 The organ that was valued the most was the heart, for they believed that a humans mind was in the heart. The brain was the least respected organ and was tossed aside. As science now proves that indeed there is brain matter in the heart, I encourage you to dive deep into your own heart center for answers to important questions. A quarter ounce bottle of Rosa arrives in a glass flacon contained in a hand crocheted pouch. It is not yet on our website, if interested please send us an e-mail. We are happy to include Rosa as a sample in our trio sampler pack, 1 full gram of this perfume is $30.00 and the 1/4 oz bottle retails for $300.00. Images: Art Heart detail and Rosa illustration by Greg Spalenka: www.spalenka.com, Old rose engraving on parchment by Roxana Villa, hand crochet pouches are designed by Roxana and Martha Villa and created with love by Martha.